We have two options for you to submit an application. You may Click Here or on the image to the right to open, fill out, and print the application. Then sign and submit via email at blassiter@lynnrayfinancial.com. Or you may fill out the secure form below as well. 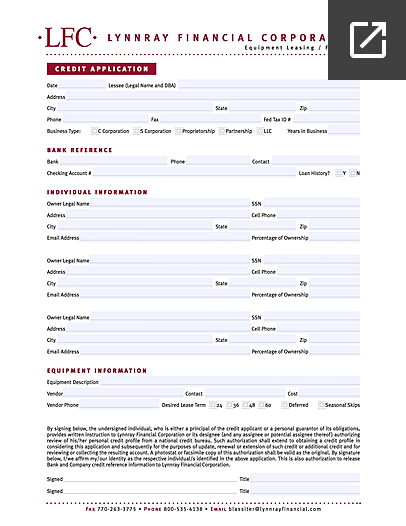 By signing below, the undersigned individual, who is either a principal of the credit applicant or a personal guarantor of its obligations, provides written instruction to Lynnray Financial Corporation or its designee (and any assignee or potential assignee thereof) authorizing review of his/her personal credit profile from a national credit bureau. Such authorization shall extend to obtaining a credit profile in considering this application and subsequently for the purposes of update, renewal or extension of such credit or additional credit and for reviewing or collecting the resulting account. A photostat or facsimile copy of this authorization shall be valid as the original. By signature below, I/we affirm my/our identity as the respective individual/s identified in the above application. This is also authorization to release Bank and Company credit reference information to Lynnray Financial Corporation.